Great and increasing inequities exist between the peoples of the Third World and those of the First. As well, we find ourselves threatened by imminent environmental catastrophes largely as a result of trying to maintain such inequities. This clear and straightforward text explains the complex origins of such bodies as the International Monetary Fund, the World Bank and others, and demonstrates the extent to which they exacerbate the problem. The situation is now so grave that we can no longer afford the luxury of leaving it to the professionals. We are all involved. We find ourselves hearing daily news reports of wars, starvation, the HIV/AIDS pandemic and natural disasters, rendered worse by inadequate international responses. The United Nations, once seen as an effective arbiter and mediator in such matters, now finds itself unable to exercise authority adequately. 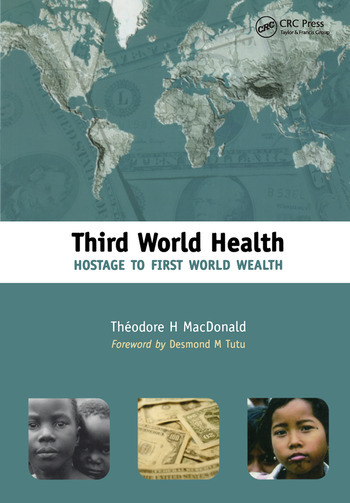 Third World Health: hostage to First World Wealth adopts a positive approach and puts forward various ways in which people at all levels can become more involved. It addresses the pivotal issue of health in the Third World and argues that it is very much hostage to the globalization of trade by and for the benefit of First World agencies. Health and poverty. Problems caused by inequities in wealth and by environmental damage. Mortgaging the Third World. The conflict between health and global conflicts: a case study. Finance. Popular opposition to the inequities. Milk and imperialism. The impact of First World wealth on Third World health: British American Tobacco in China. The tobacco impact worldwide. The Third World and HIV/AIDS. Peru - a detailed case study of one Third World country. Cuba - model or monster? Possible routes to global health equity.